Great fishing conditions are finally consistently here! Weeks full of sunny weather and warm temperatures have made our fishery come alive. Bait is everywhere and eager fish are chasing it down. Anglers have a whole host of options now that our seasonal species have arrived to compliment the traditional targets of redfish and trout. It’s little wonder our waters are now full of fishermen waiting for “the strike”. 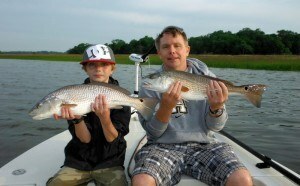 Fishing for redfish remains very productive. Blue crab fished on the bottom is deadly. Remove the shell and legs of a blue crab and cut the body in half. Put a size 3/0 circle hook through the hole where the flipper fin used to be and make sure the hook point is exposed. No need to hold the rod, instead put it in a rod holder. Once that rod starts to bend, don’t touch it until the drag starts screaming! We’ve found the most consistent trout action to be on artificials instead of the traditional popping corks. Small plastic artificials that mimic small baitfish have been getting crushed. The Z-man 3 ¾” streakz in smoky shad is an excellent choice. Paired with an 1/8oz. jighead, these lures worked best bumped slowly along the bottom. Trout will usually hit when you lift them up in a jigging motion. The flounder bite has been better than seasons in recent memory. We’ve been picking up lots of flounder with mud minnows under a popping cork. Of course, the more traditional method of fishing finger mullet along the bottom around structures is still a go-to technique. Move the bait slowly and when you think you have a bite wait a few seconds (if you can) before setting the hook. My favorite summer time fish is the ladyfish. Ladyfish are becoming increasingly present with the warmer water. These lively fish will smack bait under a popping cork and make your drag zing. Their acrobatic jumps and hard runs make these fish so entertaining. You’ll often catch them in the same spots you target trout.